The Apple TV 4K is gaining support for Dolby Atmos surround sound in tvOS 12. Other devices, including the Roku Ultra, Amazon Fire TV with 4K, Xbox One, and even Windows 10 PCs support Dolby Atmos. But what is Atmos? While other devices support Dolby Atmos sound, the Apple TV 4K will be the only streaming player with support for both Dolby Atmos surround sound and Dolby Vision HDR video. Traditional 7.1 surround sound involves seven speakers plus a subwoofer. These speakers are placed around your room: front left, front center, front right, subwoofer, left, right, back left, and back right. 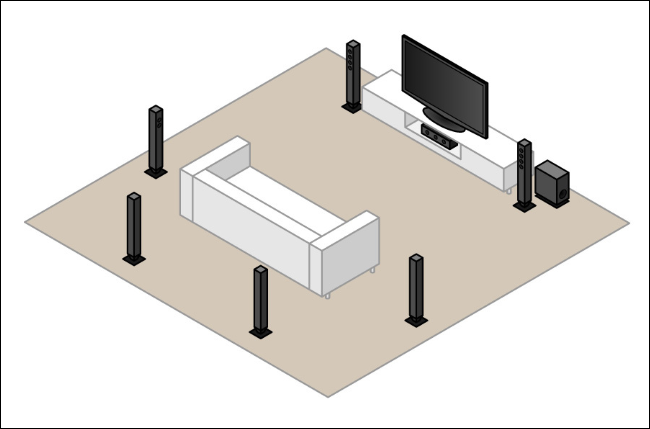 5.1 surround sound is similar, but omits the left and right side speakers and just uses front and rear speakers. When you’re playing a video or any other content source that supports 7.1 surround sound audio, there are actually eight channels of audio being sent to your sound system. These channels are each played through a different speaker. The different sounds coming from different speakers around you produces the surround sound experience. In other words, 7.1 surround sound content just includes eight separate channels of audio. Each channel is sent to a separate speaker. A 7.1 surround sound system. Dolby Atmos is a more advanced type of surround sound. Dolby Atmos-enabled audio sources don’t just contain six or eight channels of sound that are sent to your speakers. Instead, sounds are mapped to virtual locations in 3D space. For example, a sound might be mapped above you. This spatial data is sent to a Dolby Atmos-enabled receiver, which uses specially calibrated speakers to position these sounds in your listening area. For example, that soudd positioned above your head can be bounced off your ceiling by upwards-facing speakers. Some Dolby Atmos systems may use ceiling-mounted speakers, instead. In other words, Dolby Atmos sound doesn’t involve just playing several channels of audio. It uses a special receiver with special speakers, and the audio played is positioned in 3D space and carefully calibrated according to your speakers and the acoustics in your room. This results in a more immersive surround sound experience. This isn’t just for home use. Dolby is also pitching Dolby Atmos in movie theaters for improved surround sound at the movies. Dolby Atmos isn’t the only option for this sort of surround sound. In the same way that DTS competes with Dolby Digital audio, DTS: X is an alternative standard to Dolby Atmos. 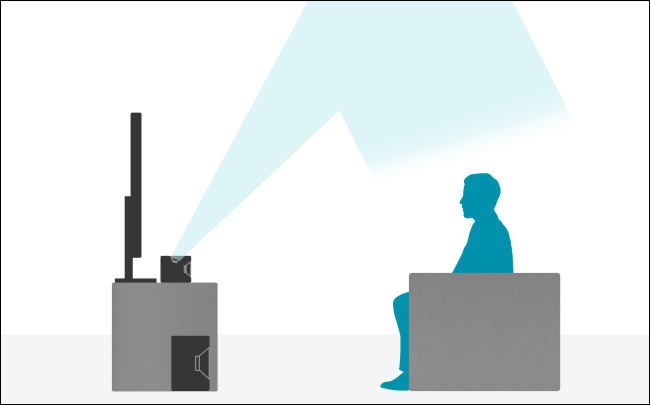 RELATED: What’s the Difference Between Dolby Digital and DTS, and Should I Care? All these fancy features don’t come for free. You need Dolby Atmos-enabled content and hardware to take advantage of it. First, you need a content source that has Dolby Atmos-enabled audio. After you find the content, you need a playback device that can pass Dolby Atmos audio to your audio system, like the Apple TV 4K, an Xbox One, a 4K-enabled Roku, or Fire TV 4K device. Your audio system needs a Dolby Atmos-enabled receiver to do the hard work, and it needs Dolby Atmos-enabled speakers that the receiver can use. Not all your speakers need to be Dolby Atmos-enabled, but you need either upward-firing speakers or ceiling mounted speakers to complete the package. This upward facing or ceiling-mounted speakers are the key. 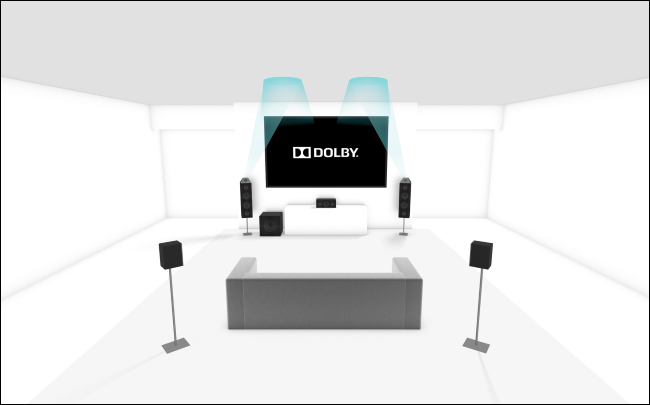 In a Dolby Atmos system, a 5.1.2 system is an audio system with five nornal speakers, a subwoofer, and two upward-facing speakers. A 7.1.4 system is one with seven normal speakers, a subwoofer, and four upward-facing speakers. A 5.1.2 Dolby Atmos system. You don’t necessarily need a surround sound system to take advantage of Dolby Atmos, however. You can buy a Dolby Atmos-enabled sound bar, which will bounce sounds off your ceiling. This won’t produce the same experience as a full surround sound speaker setup, but it uses some of the Dolby Atmos tricks. A Dolby Atmos-enabled sound bar. Dolby provides a list of movies that have been released with Dolby Atmos-enabled audio and Dolby Vision HDR. This list just contains movies, but other types of content also support Atmos. For example, the Blu-ray release of Game of Thrones is the first television show to include Dolby Atmos audio. A handful of video games support Dolby Atmos audio, too. The Vudu movie streaming service offers its 4K UHD movies with Dolby Atmos, while Netflix says Dolby Atmos audio is available on “select titles” if you pay for streaming in Ultra HD. In other words, you will have to go out of your way to find Dolby Atmos-enabled content. However, a Dolby Atmos-enabled sound system can function as a typical surround sound system and play normal surround sound audio, too. What About Dolby Atmos for Headphones? Dolby also develops a related technology named Dolby Atmos for Headphones. Unlike standard Dolby Atmos audio, Dolby Atmos for Headphones works with any pair of stereo headphones. Dolby Atmos for Headphones is a form of virtual surround sound for headphones. Blizzard’s Overwatch includes support for Dolby Atmos for Headphones. It’s also included in Windows 10, so you can use it in any PC game—however, you must pay $15 to unlock this feature. 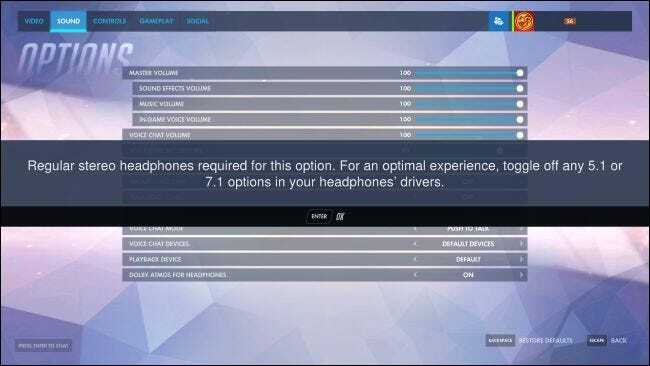 Dolby says Atmos provides improved virtual surround sound, making it easier to pinpoint where sounds are coming from in Overwatch, whether they’re above or behind you. In the home theater world, there’s always a new standard, something to spend extra money on if you want improved sound or a better picture. Dolby Atmos is just one of the latest and greatest ways to improve your audio experience—if you want to invest the money.